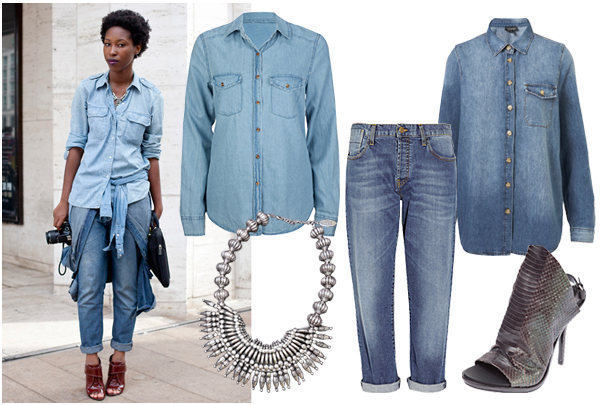 There’s always a heated debate as to whether or not denim on denim is a fashion faux pas or simply fashionable. In fact, this site was started to prove that double denim is an amazingly stylish, timeless look for all – when done right, of course. Our friends at Refinery29, who are indisputably on the fashion forefront, have broken the Canadian Tuxedo down for you, explaining how to do the look well. To read the full article and to shop the look, click here. This entry was posted on Thursday, October 11th, 2012 at 9:34 am	and tagged with Adia Kibur, ALI & KRIS, Balenciaga, Boyfriend Jeans, Canadian Tuxedo, Denim, Denim on Denim, Fashion, Jeans, Marni, Refinery29, Topshop, Vintage and posted in Fashion. You can follow any responses to this entry through the RSS 2.0 feed.